In a statement released on 5 April, the Victorian government says it has reached an agreement with property developer CBUS to have the $1 billion Collins Street tower reduced in height by 21.6 metres (from 163 to 142 metres). Apparently, this will be enough to get the project through planning, which recently rejected the project much to the disarray from some. This could well be the final planning chapter of the 447 Collins Street story which began in 2014 as a singular 295-metre skyscraper and has now gone through three major alterations. 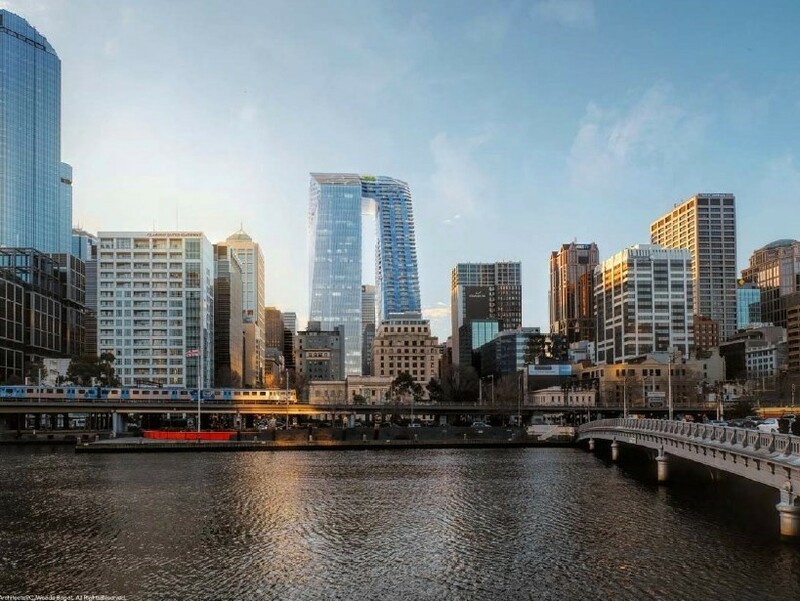 The current proposal consists of two towers, one commercial and one residential, which link up at their 47-storey apex to form Melbourne’s only skyscraper skybridge. The building’s shape has seen it earn the nickname of ‘pantscraper’ which presumably comes from its similarity to China’s Gate to the East building which shares the same nickname. The development will occupy a 5926sqm island site bounded by Collins, Williams and Market Streets and Flinders Lane. It will also see the transformation of a portion of Market Street into a publicly accessible park. Following negotiations, the developer will now submit amended plans before a planning permit is granted for the development proposal.